Good morning! It’s the beginning of Wasteland Weekend! 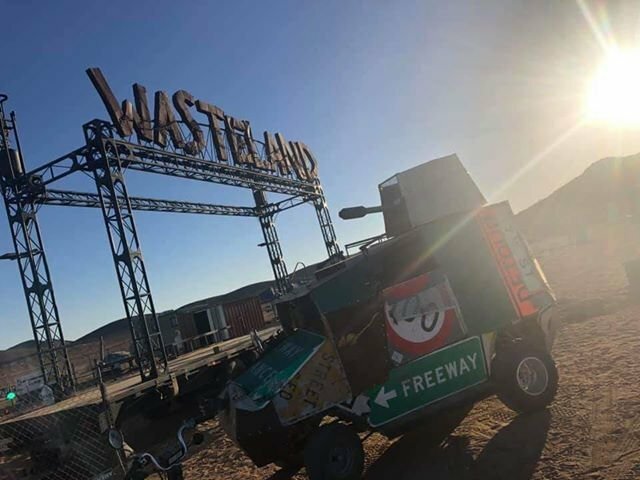 Our Creative Director Farren Fox is stationed out in the deserts of Kern County California to attend the show, and will be sharing Fractured Lands bottlecaps and shirts with the wastelanders there! We’ll have lots of pictures coming in, but wanted to share this first shot from our friends V2A who’ll be performing that weekend! Most of the work on our plate is centered around Season 2! We’ll have more to share with this soon, sorry for the wait! We hope everyone enjoyed the Free Weekend, we’ll definitely be hosting another to commemorate Season 2 along with some other promotions we hope will entice you back to Fractured Lands. In the meantime, grind for those Season 1 items, and we’ll join ya along the way!